An irony that the World Kitchen Garden Day needs to be celebrated indoors every year in Mumbai due to heavy rains. But that does not stop the crowd of more than 200 spirited gardeners from having a gala time! Check out at leisure about how Mumbai celebrated this Day. chewing on my bubblegum, CHOMP!.. CHOMP!..CHOMP!..CHOMP! playing with my YO-YO, DOO-WOP!.. DOO -WOP!, DOO-WOP! And watching the birds fly by and then along came HERMAN THE WORM..."
The World Kitchen Garden Day's ice breaking session started with the participants moving to the beats of this song . The AV hall at Maharashtra Nature Park rang with the sounds of laughter as the participants lead by Mirabelle D'chunha danced to this song. Young and old all joined in the fun as we tried to get people to connect. People from all over Mumbai had converged on to the Maharashtra Nature Park, Mahim to join the World Kitchen Garden day celebrations. This was first time that all urban farming groups in Mumbai came together to celebrate. 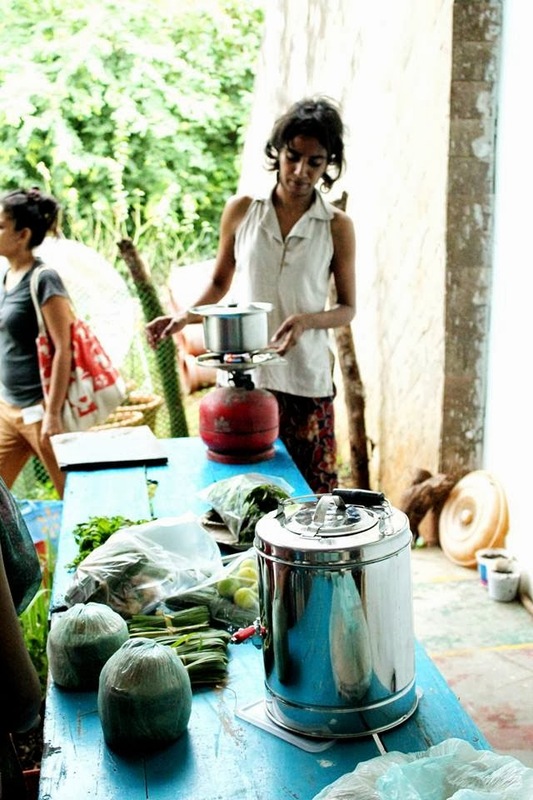 Mumbai is a huge city and the objective of the celebration was to provide a platform to kitchen gardeners to connect with other like minded people and kitchen gardening groups in their local areas to take the movement forward. It was the first time that an Urban Leaves event was based on a format inspired by the Open spaces philosophy. We had multiple sessions offered by participants running in parallel at various spaces in the spirit of "Giftivism". Participants had the freedom to attend any session that interested them. Since this was our maiden attempt at this format or unFormat it was challenging for the organizing team us as well as for the participants. The first half of the event was a little chaotic with participants tried to first understand the format as well as tried to reach a decision about which workshop to attend. The choices were so enticing that it was difficult for many to reach a decision. It was vibrant a "Mela" (Fair) of people moving around like bees trying to gather the honey of knowledge from various flowers. We had workshops/discussions hosted by Blooms, Green Souls, Urban Leaves, RUR happening simultaneously in various spaces. We had Square Foot Gardening (Prakash Shetty), Window sill gardening ( Priyanka ) Home composting (Monisha Narke) , Agnihotra (Vidya Didwania) , a biodiversity walk (Aristo Mendes), Introduction to Bees (Anand Manjrekar) , Compost tea (Nitya Anand), Children's activities (Mrunalini Gole) running in parallel in the first half of the event. Prakash Shetty and his demo on sq ft gardening. Saroj Chaudhary and Abha Gupta wowed the participants with recipes made from fresh and seasonal produce like palak (Spinach), shewga (moringa) leaves, paan (betel e)leaves. Who would have thought that the humble palak will taste so heavenly as a roll, or that we can make laddu's out of pan leaves or a chatpata chat could be made with these seasonal vegetables. 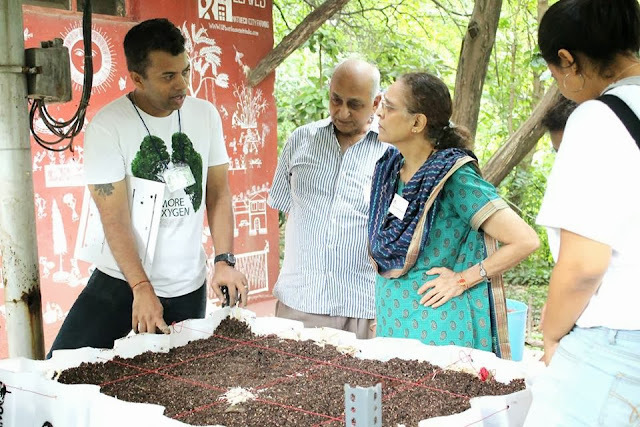 Post lunch we had sessions on Seed saving (Gaurang Barrot) , Designing a food forest (Preeti Patil), Making toys from recyclable items at home (Kala Ponnuri), Amrut jal and Amrut Mitti (Purvita Kapadia), Trellis making (Vipul Sanghavi). A delicious Lunch by The Health Awareness Center delighted everyone with their mouth watering healthy specialties. While all activities were happening we had a steady stream of visitors to the "Do nothing tapari" for a sip of the refreshing herbal tea along with jhal mudhi(a puffed rice bhel snack). This was last minute addition provided by Shammi Nanda to enable participants to just chill out in a corner and connect over a cup of hot herbal tea. Shammi also guided us throughout organising the open space unformat of the event. A special feature during the day was a session conducted by him on the lines of Non Violent Communication. A problem that we all encounter in our urban areas is that of our housing societies disallowing members to plant kitchen gardens. Shammi's session focused on how to deal with such societies and convince them. There were many takers for this session too. An important session by Tejal Vishweshwar regarding the threat of GMO'S in our food called Need, Weed,Seed highlighted the importance of kitchen gardeners and farmers and consumers taking the step to ensure food safety. And how one could ensure self sufficiency and learning through activities like kitchen gardening. Herman or rather Herman-jeet the worm once again made the participants sway to his tune in the closing circle. Our behind the scenes hard working team. All this would not have been possible without our behind the scenes volunteers who strove before, during and after the event to make it a success. Neesha Noronha thank you for giving shape to the unformat chart through your creative inputs. Amit Malgaonkar, Kavita and Hemant Khosla, Bhagyashree Kelkar, Hemali Mehta, Joslyn Almeida, Prema Aiyer, Sheetal Sanghvi, Ashfaq Ahmed thank you for being there and providing your support. A special thank you to Prajakta Patil, Trisha Basu and Samir Jain for covering the event through their lenses. The beautiful photographs of the event are the fruits of their efforts. The feedback that we received from the participants post the event is positive and encouraging with valuable suggestions for improvement. Many commented that it was difficult for them to make a choice regarding which workshop they should attend as there were so many to choose from. This is true especially for a society which is so used to having things decided for them. Having freedom to make a decision for self learning is something we all are not used to, as this natural instinct is stifled in our current schools and in our society. Our learnings from the events were many: We learnt that people need to understand and be prepared for a little chaos in the beginning. Although we had announced the format on our blog and our networks, had requested participants to connect prior to event, many had not read or seen these posts and were therefore unaware of what would be involved. We hope as years go by we will be able to help people understand this format better and get involved more deeply. We also learnt that this unFormat has something to offer to everyone right from a novice to people already on the path of urban gardening. It also makes people think and take a conscious decision and focus on what they currently need, (there's a world of difference in what we want and what we need and in life) to move on with their work. For those who haven't started on, it gives a chance to explore and experience. Thank you all for making this event such an eventful one. There was learning in it for all of us, from un-Organizing to hosting workshops and discussion in open spaces. To those who felt a little disappointed at not being able to take it all, we would like to share that we have noted your feedback and hope to help you understand the process of open spaces a little better. The highlight of the event as we experienced it was the opportunity that so many of us got to showcase what we were doing in this field of kitchen gardening. New talents emerged. New friendships were made. Focus this year was to facilitate networking and new friendships. For more detailed photos of the event, CLICK HERE. Garlands made from kitchen waste adorn our necks and delight our hearts!